Wins for Partick Thistle, Kilmarnock and Hamilton Academical as Hearts draw with St Johnstone. F.C. Kilmarnock, who are still unbeaten, beat Glasgow Girls 2–0, Hamilton Academical won 12–0 over Hutchison Vale, Heart of Midlothian were held to a draw by St Johnstone, while Partick Thistle beat Dundee United 2–1 at Petershill Park, securing their first-ever win in the SWPL 2. Kilmarnock continued their unbeaten start to the SWPL 2 season as they beat Glasgow Girls 2–0 at Rugby Park. Samantha Hare grabbed the opener in the 25th minute after a great pass from Laura Neil. On 92 minutes, Clare Docherty lobbed the ball past Toni Harkness to put the match beyond the visitors. Hamilton Academical ran riot against Hutchison Vale, who have now conceded 21 goals in just two league matches, at New Douglas Park, scoring three goals in the first half and nine in the second. Northern Ireland international Jade Lindsay opened the scoring in the 14th minute, while captain Amy Anderson converted a penalty in the 21st minute before netting her second in the 35th minute. The second half saw a double from Dionne Brown, a double from Amy Bulloch and a hat-trick from Nichola Sturrock. MT Gardiner and debutant Chloe Muir also scored one each. Just as it looked like the match was going to end in a goalless draw, the hosts finally found the breakthrough in the 84th minute, when Lauren Evans got on the end of a great pass from Rachel Walkingshaw out on the right wing and put the ball past Rebecca Cameron. However, Hearts were unable to hold onto their late lead and St Johnstone earned themselves a point when Rachel Todd's corner in the 87th minute was slotted in by Fern Newbigging with the assist from Fiona Mearns. Emma Lawton put the hosts ahead in the 12th minute, when she got on the end of a lofted pass and saw her deflected shot find the back of the net. Cheryl Rigden then made it two-nil in the 29th minute, when she fired home past Aaliyah-Jay Meach after a great pass from Sara Paterson. 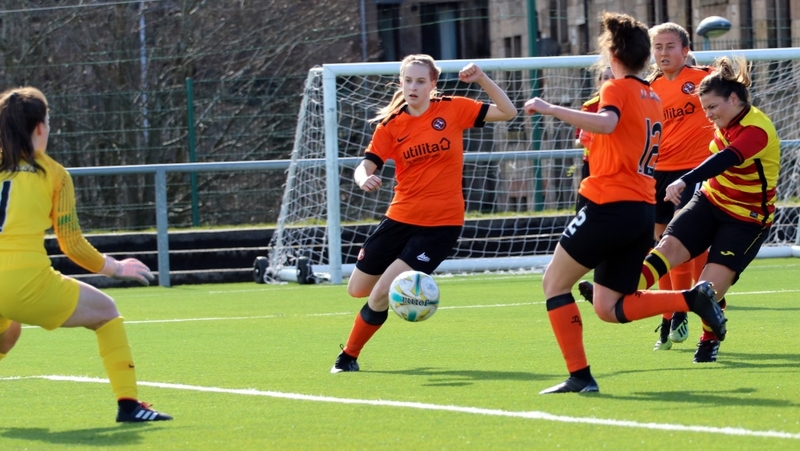 Second-half substitute Catriona Caine grabbed one back for Dundee United with a good finish in the 85th minute, but the hosts managed to hold on and secure the three points as well as their first-ever win in the SWPL 2.